'Think global, act local,' says President Macri as mayors from more than 20 cities gather in Buenos Aires for the Urban 20 inaugural summit. President Mauricio Macri today declared Argentina should think global but act local after meeting with representatives from more than 30 cities across the world at the Casa Rosada. 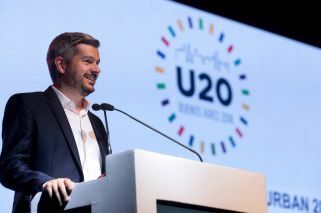 The leaders were in the capital for this year's Urban 20 summit, an initiative on sustainable urban development that brings together officials from the largest cities of the member states of the G20. “We must think globally but act locally,” said Macri at a press conference with Urban 20 leaders. "Cities and local governments are key actors, they are the protagonists of global trends." The Urban 20 inaugural summit, held Monday at the Buenos Aires' Exhibition Centre, brought together nearly 5,000 people, including mayors, high-level urban stake-holders, financial institutions and global change-makers speaking about the role of cities in relevant G20 priority areas, including social inclusion, gender equality, the future of employment and climate change. "This is a real milestone in the diplomacy of cities: it is the first time that the G20 will incorporate the urban perspective in its process," said Secretary General of Buenos Aires City Fernando Straface. "The Urban 20 is the bridge between mayors and national leaders." According to Urban 20 leaders, cities are large economic, demographic and innovation centres: they represent 54 percent of the population worldwide and produce more than 80 percent of the world's total GDP. However, they are also responsible for more than 70 percent of carbon dioxide emissions. “We are the first generation experiencing the effects of climate change, and the last who can do something about it,” said Eduardo Machiavelli, the City government's minister for the environment and public space. Argentina was one of the first countries to join the Paris Agreement in September 2016, with the goal of keeping the increase in global average temperature to well below 2°C above pre-industrial levels and limit the increase to 1.5°C. Since then, the City government has been investing in renewable energy usage, sustainable mobility and waste management to reach its goal of zero-carbon emission by 2025, Machiavelli added. Launched in December 2017 at One Planet Summit in Paris, the Urban 20 initiative is chaired by the cities of Buenos Aires and Paris, and is supported by the Climate Leadership Group of C40 Cities and the United Cities and Local Governments (UCLG). The mayors of Buenos Aires, Paris, Rome, London, Madrid, Berlin, Sydney, Chicago, Montreal, Seoul, Tokyo, Jakarta and São Paolo are among who signed onto the Urban 20 foundation statement in July 2018. "For the city of Buenos Aires it is an interesting challenge, to be integrated into the main networks of cities around the world, actively working as a protagonist to change things and coordinate our efforts with other cities around the world and in Argentina,” said Cabinet Chief Marco Peña, who also attended the event.